Look Back in Mild Bewilderment: What exactly does £3m a year buy you? What exactly does £3m a year buy you? With the Albion almost certainly safe for another season there is much speculation over the future of Head Coach Roy Hodgson whose contract expires at the end of the season. Plainly Roy harbours ambitions with regard to the England job and the agreement between him and the club makes him available for the role that was always going to be available this summer. The saga has taken a couple of twists over the last week. Firstly Roy has made a few comments about the club matching his own ambitions which is football code for "give more money or I am off" and secondly a report in the Daily Mail that the club are preparing to offer Hodgson a £3m a year contract to head off a possible approach from the FA. I seriously doubt the numbers quoted but the article did prompt a lively debate on Baggies fan forums and someone posted the following table from Futebol Finance. 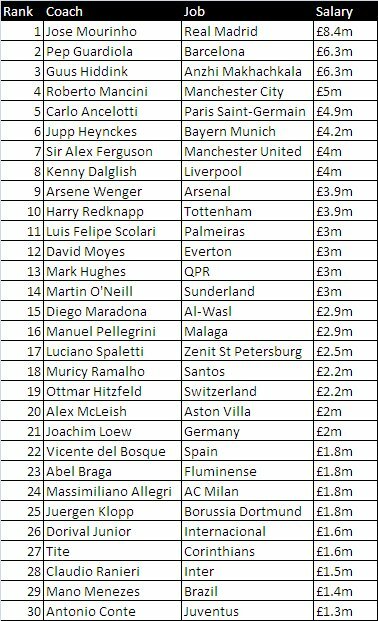 From this it is possible to glean that 50% of Premier League Clubs pay their manager more than £2m pa and the rest pay less than £1.3m. Looking at the list one has to ask what do QPR Sunderland Villa and Everton get for their money? From a financial perspective there is very little difference in being a little bit better mid table side and unless a club can mount a serious challenge for the champions league then nothing much changes unless you are relegated. Given a decent squad and a competent manager most clubs will survive although the 3 weakest, most poorly run and or unluckiest will not. If the squad is just too weak no manager on earth will keep you up and equally give Jose Mourinho Albion's current squad or Sunderland's for that matter and neither team will be booking their trips to Milan or Barcelona. If there was any doubt look at Newcastle playing about as well as they can with a team of unsung heroes and managed by Alan Pardew whose management career has had its fair share of ups and downs. They are having a brilliant season but equally are not going to make the champions league, despite Chelsea hitting the self destruct button, an Arsenal side as about as inconsistent as any in recent memory not to mention a Liverpool side in state of expensive transition. Obviously if they had managed to retain the overpriced services of Kevin Nolan and Joey Barton then maybe they could have snagged the coveted 4th place finish or perhaps not. This brings me on to the thorny topic of a club matching a manager's ambition given that most clubs are way short of having the resources of mounting a successful bid for champions league football and Europa League football offers precious little financial return and is generally regarded by players and coaches as something like an unwanted Christmas present exactly what do these coaches realistically aspire to when they demand backing from their boards? O'Neil left Villa when Randy Learner woke up to the fact that having poured in excess of £100m into the project that it was a bottomless pit and O'Neil was making Oliver like pleas for "more". Hughes left Fulham because they could not match his ambition. He has now fetched up at QPR where the loftiest the club might harbour next season is promotion from the Championship. Tony Fernandes and Ellis Short might find that matching their manager's ambitions is both expensive and ultimately futile. 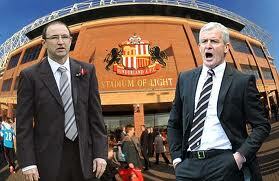 In Albion's case the ownership will not indulge a manager beyond the club's means. If we are being pushed to even pay £2m and or Hodgson's shopping list gets too unreasonable we will be starting the new season with a new coach.